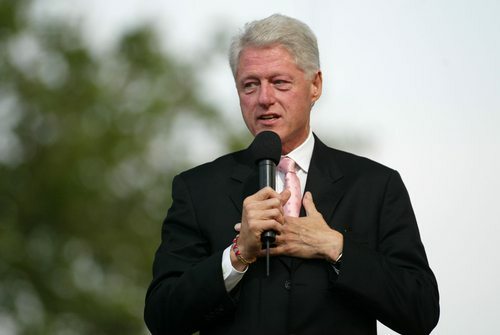 Is Clinton “Philanthropist-in-Chief” or Optimist-in-Chief? Clinton writes that “phones mean freedom.” He cites a United Nations study to say that “cell phones are one of the most effective advancements in history to lift people out of poverty.” For instance, in Haiti, where only 10 percent of the population has bank accounts, 80 percent of people have cell phones which, through a deal with Canada’s Scotiabank, they can use to conduct basic banking activities without having bank accounts. In Africa, where only four percent of the population has access to the Internet, more than half of the population has cell phones. A company called Sproxil has arranged to permit Africans to text a code by cell to determine if they might have received counterfeit medications. Clinton is also bullish about the increasing health conditions and heath resources available to developing countries. He generously—and correctly—calls President George W. Bush’s Emergency Plan for AIDS Relief his “finest foreign policy achievement” which is contributing to “winning the global fight against HIV/AIDS.” He lauds programs like Paul Farmer’s Partners in Health in Mexico, Haiti, Jordan, and Rwanda for bringing necessary health resources to entire regions. In the U.S., he mentions programs targeting childhood obesity. Clinton notes that “more people worldwide moved from poverty to the middle class than at any other time in history,” noting in passing that that may be due more to free trade than other factors. But his optimism on economic issues is rooted in green business and clean energy, a frequent theme of the Clinton Global Initiative. Under the heading of “equality,” Clinton cites progress in the social and economic power of women, arguing that “no society can truly flourish if it stifles the dreams and productivity of half its population.” Though the national legislature in the U.S. hasn’t yet surpassed the 16.8 percent mark in terms of women legislators, he sees progress on this score in places like Rwanda, the first nation in the world where more than half of the members of its parliament are women. He takes pride in a soy-processing factory his foundation is supporting in Rwanda that will contract with 30,000 farmers in eastern Rwanda, more than half of them women, to grow soybeans. Clinton sees a reduction in tensions within and among countries, citing cooperation occurring among previously warring populations in the Balkans and in Rwanda. “The persistent inequality among and within societies breeds instability and conflict,” he writes, “but there are success stories all over the world that we can use as models for reform.” He ends with an anecdote about prize-winning students from Pakistan, India, China, and Taiwan standing together for group pictures despite the conflicts in their homelands, though it isn’t clear that those tensions have abated quite as much among the leaders of these nations.